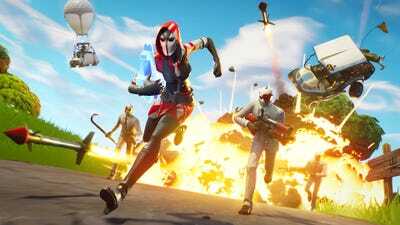 ‘Fortnite:Battle Royale’/Epic Games‘Fortnite’ creator Epic Games is setting investment records. “Fortnite” creator Epic Games has announced $US1.25 billion in new funding from multiple investors. “ Fortnite” is the most popular video game in the world, with nearly 80 million players per month. The Unreal Engine, Epic’s game design software suite, has been used by a variety of developers to create hundreds of games since 2001. Epic Games has announced $US1.25 billion in new investments, the largest ever funding round for a video game company, according to PitchBook. Epic is the creator of “Fortnite,” the most popular video game in the world, and also creates development software used by major game studios and indie developers alike. According to a press release from Epic, the new investors include KKR, ICONIQ Capital, Smash Ventures, aXiomatic, Vulcan Capital, Kleiner Perkins, and Lightspeed Venture Partners. They will join Disney, Tencent, and Endeavour as minority stakeholders. “We’re excited to partner with the finest minds in the financial, sports, and entertainment communities. This reinforces Epic’s position of leadership in real-time 3D technology, and accelerates our ability to improve the way people play, work, and interact with the world,” Sweeney said in the press release. “Fortnite” continues to see surging success, celebrating 80 million players during August 2018. The game’s popularity has led to exclusivity deals with Samsung, licensing deals with Nerf and Hasbro, and even made Sony change its policy for cross-platform play. “Fortnite” is free to play on the vast majority of gaming platforms, but earns revenue through micro-transactions. The game reached a monthly record of $US318 million in revenue during May 2018, and Epic has committed to developing a competitive community for “Fortnite” with a promise to invest $US100 million in esports. Beyond publishing major titles like “Fortnite” and “Gears of War,” Epic Games creates game design tools for other developers. Now in its fourth iteration, Epic’s Unreal Engine design suites have been used to create hundreds of games since 2001. Epic’s $US1.25 billion investment round is the largest ever for a video game company. The previous high was $US550 million, raised by Sea Limited in May 2017, according to Pitchbook data. Sea Limited is a Singapore-based company providing an online gaming portal for Southeast Asia.